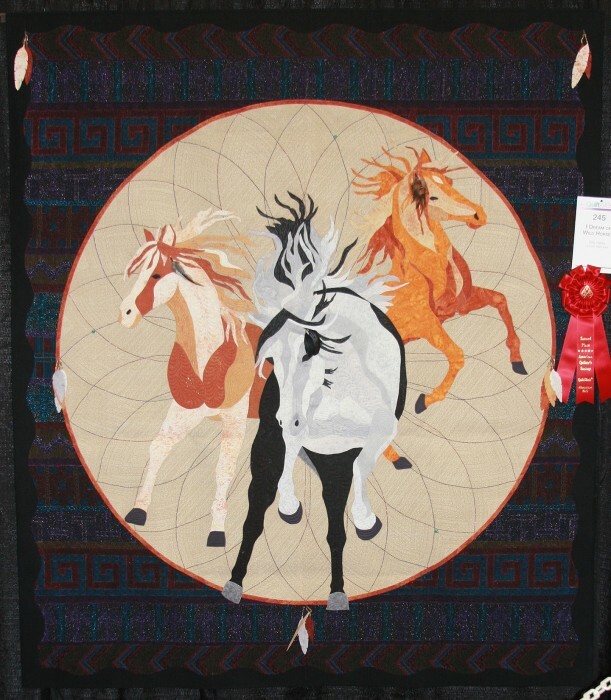 Today, I get to start showing some of the fabulous quilts that were entered into the AQS show in Albuquerque in January. There is such variety and creativity exhibited! It’s really stimulating! 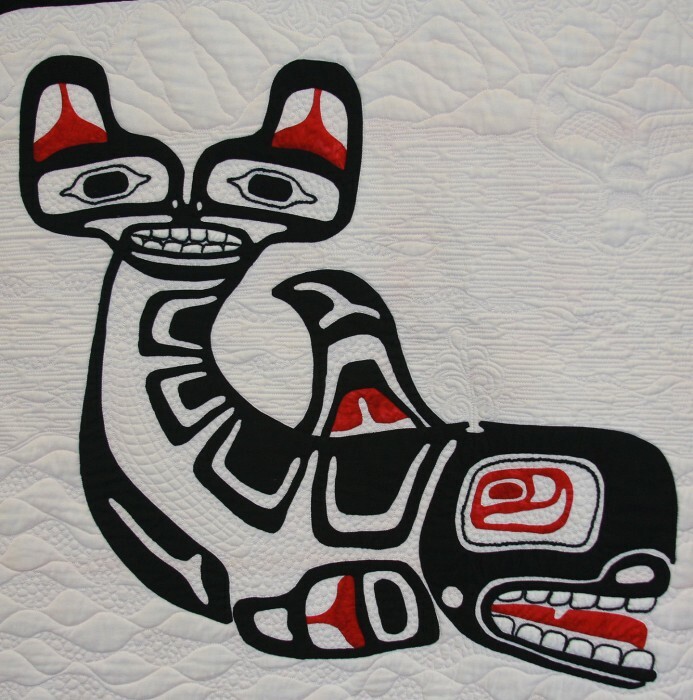 This first quilt is a stunning example of what can be accomplished with only three colors – black, white, and red – and emphasizing shapes and design. Georgia Spalding Pierce, Seattle, WA, received an Honorable mention for this stirring quilt. The black sashing represents the formal lines essential to the art form. 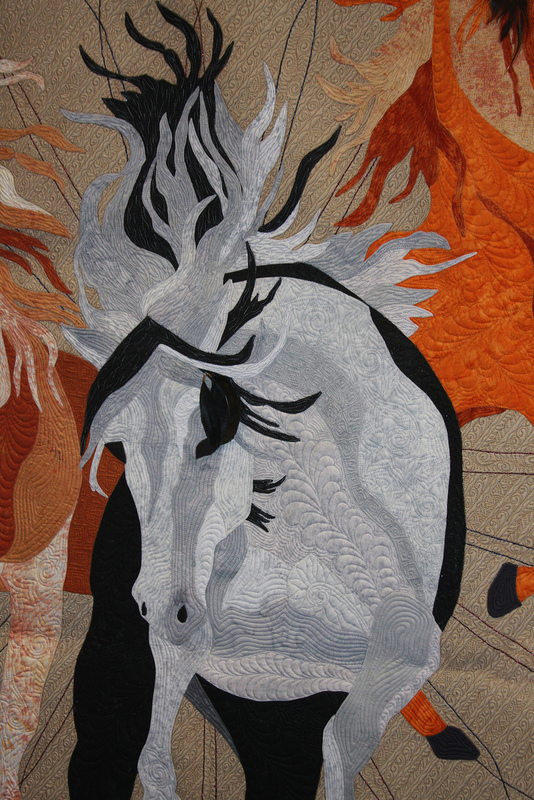 This quilt is hand-appliquéd, embroidered, and machine quilted. 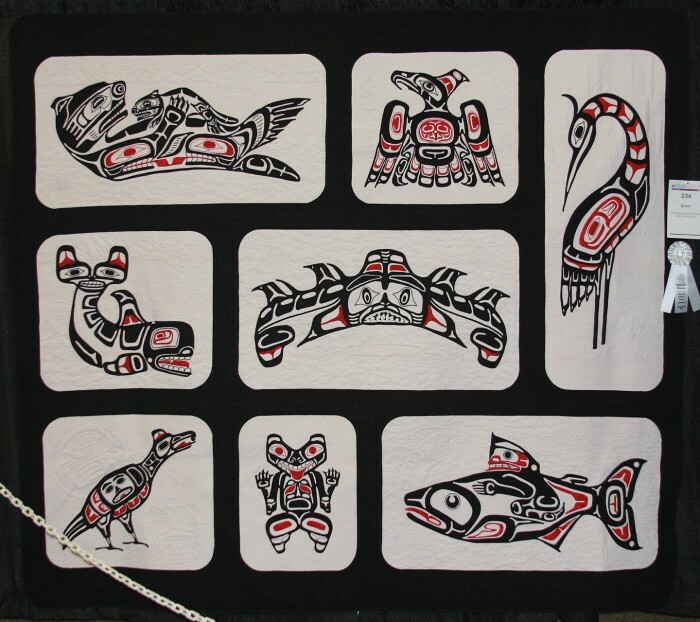 The motifs are inspired by Pacific Coast Indian art as documented by Jim Gilbert and Karin Clark. You know how I love birds! Isn’t this a great anthropomorphism of a whale? 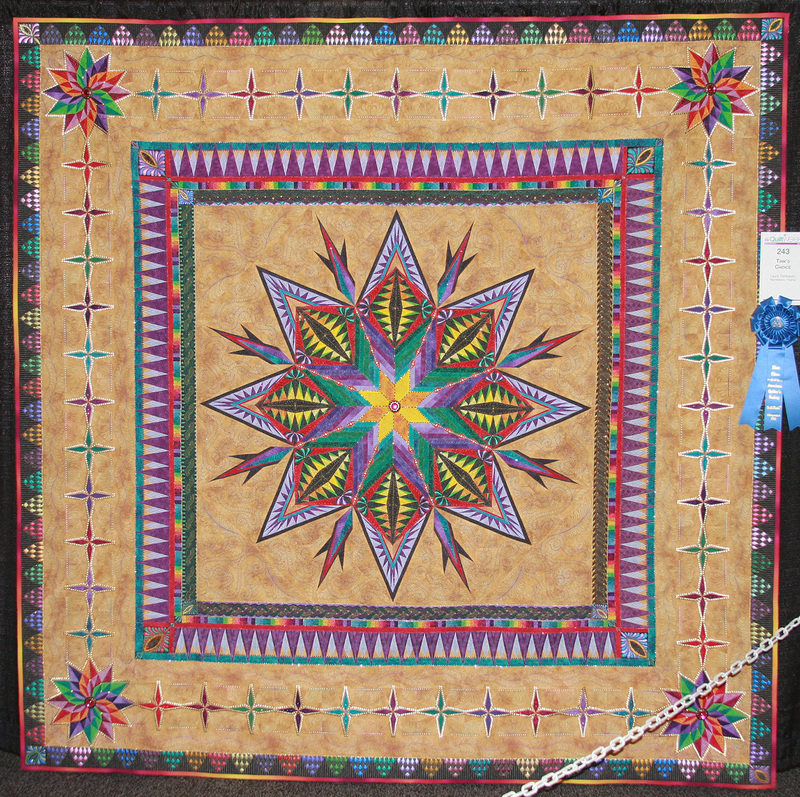 And just look at that quilting! “See Rock City” instantly grabbed the attention of my friends, some of whom hailed from Tennessee and knew exactly the story behind this quilt. They were absolutely enthralled by the story represented by seeming barn sampler. It is an enchanting quilt. Julie Sefton, Bartlett, TN, free pieced twelve barns, four Mid-South season, farm animals, tractors, silos, signs, and a windmill. Chris Ballard quilted it. Laura Trenbeath, Waynesboro, VA, won First Place for Tink’s Choice. Laura treaded dangerous ground by asking family members for their opinions as to the choice of pattern! The only one willing to weigh in was her sister-in-law, Teresa Herring, aka Tink. Good advice, Tink! This quilt is pieced and long-arm quilted. The design source is Audrey III pattern by Deb Karasik. Kris Vierra, Lincoln, NE, won Second Place for this dream catcher motif, I Dream of Wild Horses. This quilt represents the perfect good dream, as well as Kris’ passion for all things wild. 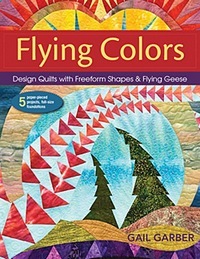 The design was inspired by a drawing by Jody Bergsma, Bergsma Gallery. 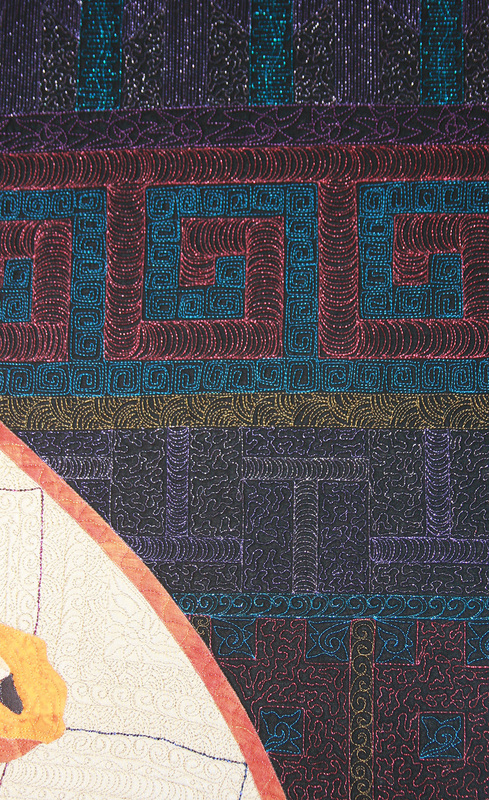 We see the wonderful quilting in this detail shot. This is truly a quilt that is lovely at a distance, and lovely close up. 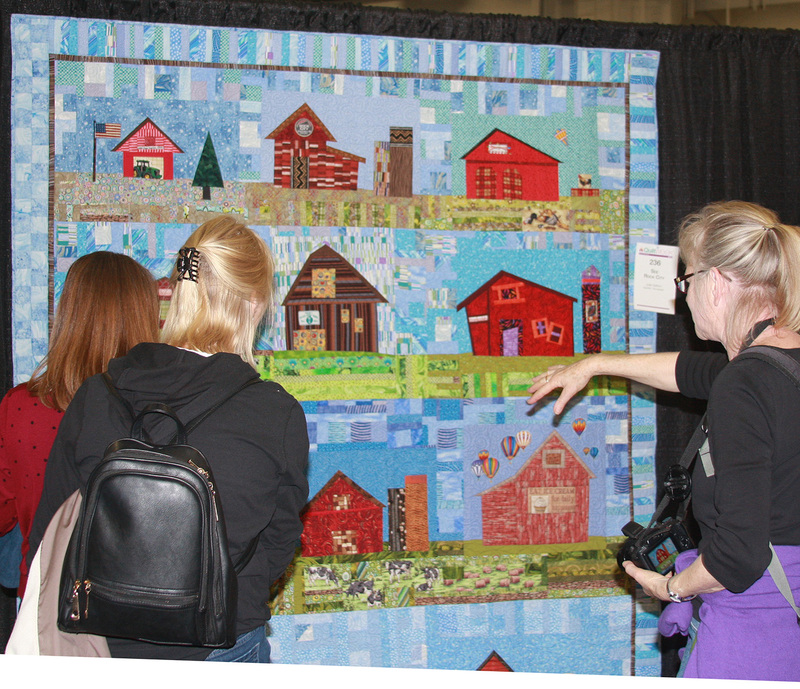 Here’s a shot from the back, showing the beautiful quilting. Look at all that delicious detail!